Undergraduate students from across the nation are invited to apply to spend a summer immersed in unique research experiences in the fields of archaeology and ecology. Southern Illinois University Edwardsville will again host 10 undergraduates, five archaeological and five ecological, during June 4-July 27, to participate in a project entitled Exploring Evidence of the Anthropocene: Archaeological and Ecological Interdisciplinary Research Experiences for First Generation Students in the Upper Mississippi River System. The Anthropocene is a proposed geological epoch in which scholars suggest current climate and environmental conditions are mostly influenced by human activity rather than natural processes. The project is part of a three-year program funded by a $287,690 National Science Foundation (NSF) Research Experiences for Undergraduates (REU) grant awarded to SIUE and the University of Illinois. Interested applicants can apply at siue.edu/STEM/REU with a priority deadline of Friday, Jan. 19. Participants receive a weekly stipend and free housing while in the program. Colaninno closely operates the program with co-PI John Chick, PhD, director of the Great Rivers Field Station, U of I Illinois Natural History Survey. The project is a partnership among the SIUE STEM Center; the U of I Illinois Natural History Survey; the SIUE College of Arts and Sciences Department of Anthropology; and Western Illinois University. Participants will conduct field studies on SIUE’s campus, at the Great Rivers Field Station in Alton, and Western Illinois University’s Kibbe Life Science Research Center. Students will engage in field archaeology and fish-monitoring programs in the Mississippi and Illinois Rivers, and will learn methodologies and theoretical perspectives that bridge archaeological and ecological concepts. First-year program participants emphasized that the valuable hands-on experience they gained through the summer 2017 REU enhanced their knowledge and research abilities. The mentorship they received through the program motivated their interests and provided guidance on how to achieve their academic goals. “I thought this was the perfect interdisciplinary combination, because it’s important to know the past to help us move forward in the present and future,” said 2017 REU participant Taesoo Jung, a senior at the University of Georgia. Senior personnel involved in the collaborative project include Corey Ragsdale, PhD, assistant professor and Julie Zimmermann, PhD, professor, both in the SIUE Department of Anthropology; the U of I Illinois Natural History Survey’s Andrew Casper, PhD, director of the Illinois River Biological Station; and Sergiusz Czesney, PhD, director of the Lake Michigan Biological Station; and James Lamer, PhD, site manager of Western Illinois University’s Kibbe Field Station. Students involved in the program will present an original contribution to the field of studies documenting the timing and scope of the onset of Anthropocene in the Upper Mississippi River System at SIUE in July 2018, and at the Mississippi River Research Consortium being held spring 2019. 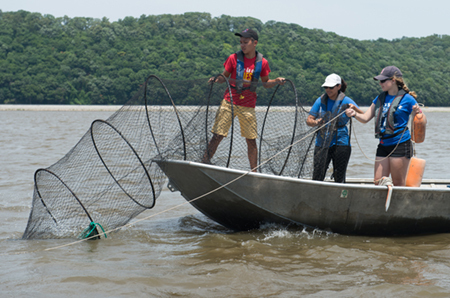 Photos: (L-R) Thomas Nguyen, of the University of Houston, Laura Martinez, of the University of Miami, and Julia Breed, of the University of Massachusetts Dartmouth, set a fyke net in the Mississippi River. 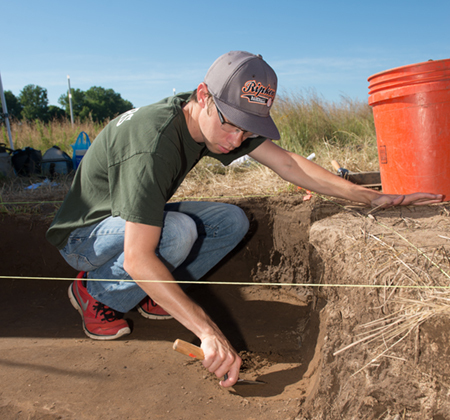 Ethan Troyer, a junior at Boston University, carefully scraps dirt at SIUE’s archeological site. 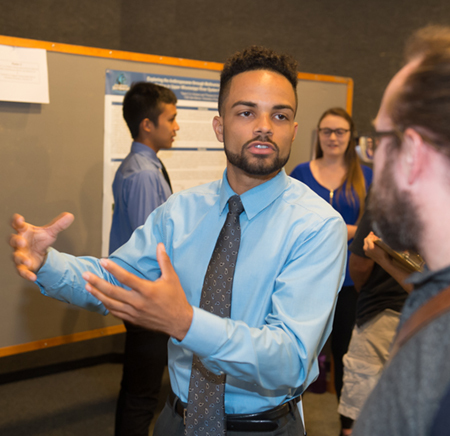 Colby Williams, a junior at the University of South Florida, explains his research project during the REU Symposium at SIUE.